Are you interested in how big data can be used to support government performance and accountability? 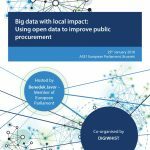 Would you like to learn more about the evidence of government favoritism in public procurement across the EU and beyond? Would you like to discover what practical tools governments, journalists and civil society members can use to better understand public procurement performance? Do you want to discuss, together with European Commission experts, how the EU can help promote greater openness and transparency in the future? Join us in Brussels to debate these and other issues as we present the DIGIWHIST project results! See the attached agenda for more details. A light sandwich lunch will be served before the event, starting at 12:00.